FactSet Geographic Revenue Exposure data (based on the most recently reported fiscal year data for each company in the index) was used to answer this question. For this analysis, the index was divided into two groups: companies that generate more than 50% of sales inside the U.S. (less global exposure) and companies that generate less than 50% of sales inside the U.S. (more global exposure). Aggregate earnings and revenue growth rates were then calculated based on these two groups. 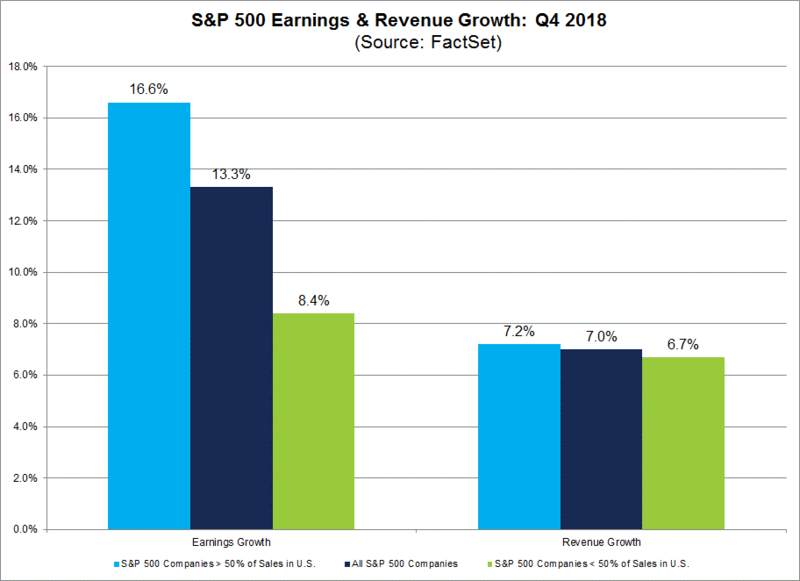 The blended (combines actual results for companies that have reported and estimated results for companies yet to report) earnings growth rate for the S&P 500 for Q4 2018 is 13.3%. For companies that generate more than 50% of sales inside the U.S., the blended earnings growth rate is 16.6%. For companies that generate less than 50% of sales inside the U.S., the blended earnings growth rate is 8.4%. The blended revenue growth rate for the S&P 500 for Q4 2018 is 7.0%. For companies that generate more than 50% of sales inside the U.S., the blended revenue growth rate is 7.2%. For companies that generate less than 50% of sales inside the U.S., the blended revenue growth rate is 6.7%. Based on current EPS and revenue estimates for 2019, S&P 500 companies with higher global revenue exposure are also expected to underperform S&P 500 companies with lower global revenue exposure in terms of earnings and revenue growth for 2019. 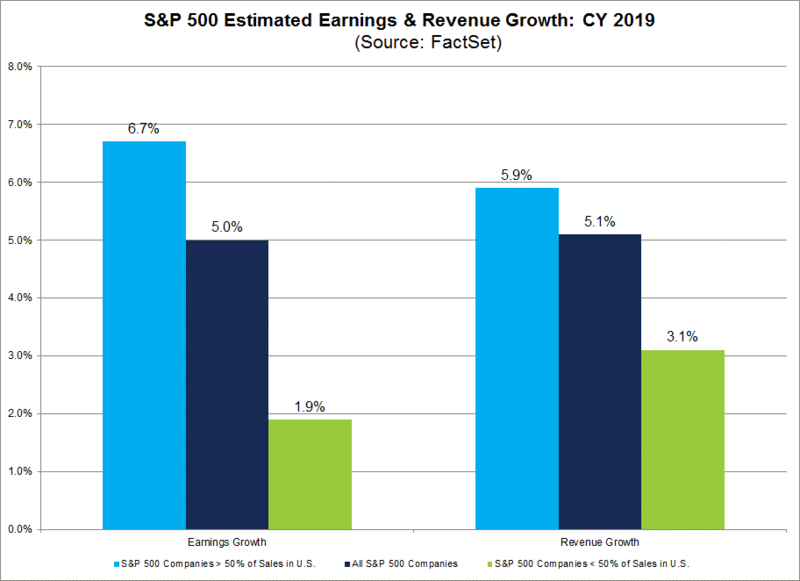 The estimated earnings growth rate for the S&P 500 for CY 2019 is 5.0%. For companies that generate more than 50% of sales inside the U.S., the estimated earnings growth rate is 6.7%. For companies that generate less than 50% of sales inside the U.S., the estimated earnings growth rate is 1.9%. The estimated revenue growth rate for the S&P 500 for CY 2019 is 5.1%. For companies that generate more than 50% of sales inside the U.S., the estimated revenue growth rate is 5.9%. For companies that generate less than 50% of sales inside the U.S., the estimated revenue growth rate is 3.1%.